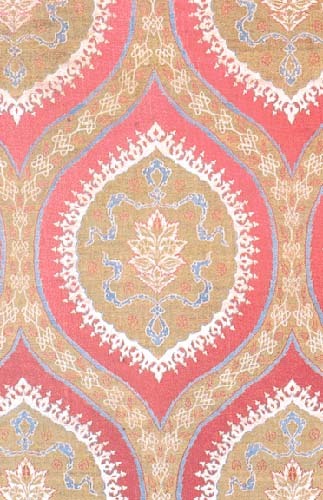 Turkish fabrics are unique in weaving features, materials used and designs reflecting Turkish taste. Research on the subject identified about six hundred and fifty names such as Kadife, Atlas, Gezi, Canfes, Selimiye, Hatayi, Catma, Seraser, Sevayi, etc. 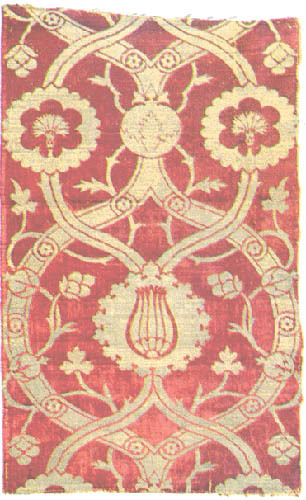 The main material was silk with gold and silver threads, rich in motifs such as flowers (tulips, carnations, roses, spring blossom, and hyacinth), trees (apple, date palm, cypress), animals (peacock, deer), crescent moon, star motifs, fruit (pomegranate, apple, date, artichoke, pineapple), etc. An excellent reference on the subject is "The Art of Turkish Weaving", by Nevber Gurusu, Redhouse, Istanbul, 1988 with an extended list of additional resources. The geographical situation of Ottoman territory has always made it a natural trade route for merchants plying between the East and West, and from the very earliest times Bursa has remained a lively centre of trade and commerce. 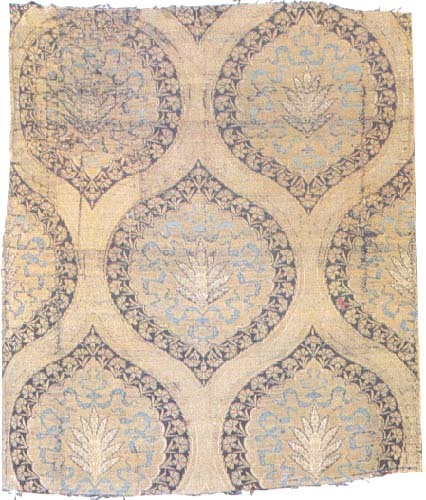 Textiles were given great importance in the Ottoman court and were registered as belonging to the treasury. The demand by members of the court for luxury fabrics was an influential factor in the increase in production and rise in quality. It was from the Palace that all the arts were orientated and retained under the control of a single centre. The principles to be obeyed by all groups of tradesmen were contained in the regulations in the Bursa, Edirne and Istanbul laws governing trades and markets ((Ihtisab kanunameleri) of 1502. A very large section of these laws applied to weavers, and to silk weavers in particular. The methods and the standards to be applied in obtaining the raw material, in spinning the thread and dyeing the material were clearly laid down. The number and weight of the warp threads, the main factors by which the quality of the fabric was determined, were also clearly established. Craftsmen failing to comply with the required standards were liable to punishment. Moreover, the gold and silver threads used in textiles had to be drawn in workshops (simikeshaneler) under direct state control and bear the official control seal. The state was responsible for pressing the cloth after it had been removed from the loom. The cloth was finally measured, its length checked and stamped, and permission was given for its sale. All this was carried out by officials (muhtesip) under state supervision. The state was also assisted in this work by the control exercised by the guilds over their own members. There can be no doubt that these various controls provided the basis for the excellence achieved in 16th century fabrics. Textiles were divided into three categories-cotton, wool and silk. 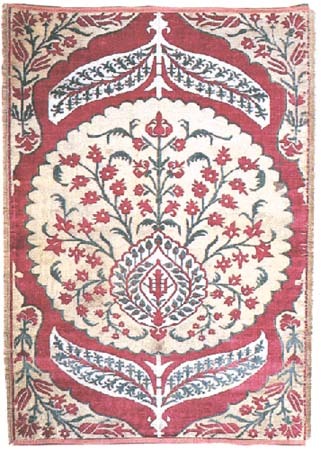 Although a great deal of cotton was produced in Anatolia, it was not sufficient to meet the demand and cotton was also imported from the East, India in particular. The same applied to wool supplies. 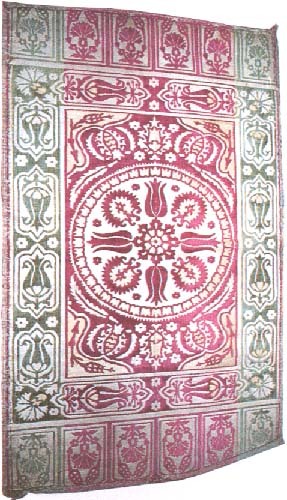 Broadcloth was manufactured in Salonica from the 15th century onwards, but as this was used in both civilian clothes and military uniforms local supplies proved insufficient and cloth always had to be imported from western countries such as France, England, Italy, Holland and Hungary. On the other hand, the mohair produced from the 16th-17th centuries onwards in the Ankara region, a type of cloth that was always very eagerly sought after, not only satisfied the local demand but was also exported in very large quantities. An inferior type of cloth of rather cheap affinity to European serge, was very popular among the common people. Silk is a costly fabric which requires a great deal of labour, the raw materials for which are very difficult to obtain. There is documentary evidence to prove that the silkworm was being cultivated in Bursa and the surrounding countryside long before the arrival of the Ottomans. Bursa was thus an important commercial centre in which silk thread was both produced and woven in quantities sufficient to meet the requirements of both the domestic and foreign markets. Bursa was the most important of all the centres of the silk-weaving industry, including Istanbul. The main types of silk fabric can be classified as taffetas, satin velvets, brocades, kemhas, dibas and serasers. 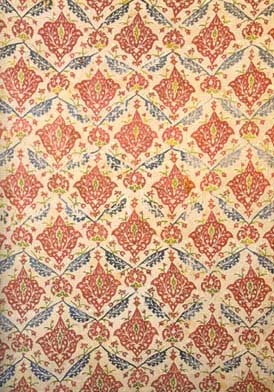 Among other types of more lightly woven silks canfes (a fine taffeta) and burumcuk (a kind of silk crepe) may be cited. 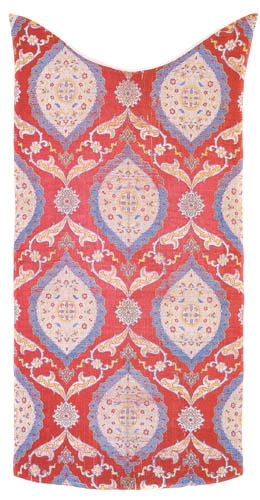 The Turks were superior in weaving of silk fabrics, in which the colours, motifs and compositions employed resulted in productions of quite incredible beauty. The favourite colour was a dark crimson known as guvezi. This colour was used mainly as a ground, in perfect harmony with the blues, creams, greens and black fibres with which it was woven. An incredible harmony was produced between strongly contrasting colours. Turkish designs are most clearly distinguished from Iranian in particular by the sharp contours and ornamental patterns around the motifs . Natural motifs such as tulips, carnations, hyacinths, roses, hatayis, pomegranate blossoms, spring blossoms, pine cones, the sun, the moon, clouds and stars are naturalistically rendered and clearly-recognizable, creating a very lively and attractive composition. The brocade cushion covers of the 16th-17th centuries and the 18th century embroidered cushions displaying the same designs arouse the interest and admiration of all who see them. As many varieties of silk fabrics as possible are displayed in both the permanent and temporary exhibitions at Topkapi Saray. The exhibits are selected mainly from the collections of catmas, silk velvets, serasers, serenks, satins, velvets, kutnus, canfeses and burumcuks. Catma is a kind of velvet fabric with a double ground and raised design. In the 16th century the fame of Bursa catmas spread far beyond the confines of the Empire, Although a very costly fabric, it was in great demand in foreign markets and was one of Bursa’s most important exports. It was also very popular on the domestic market and occupied an important place among the gifts presented to foreign heads of state by envoys and ambassadors. This is the reason for the large number of catma cushion covers in European and American museums. 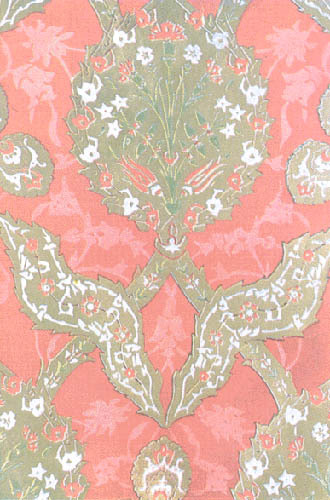 The Ottoman kemha fabric known to westerners as “brocade”, was also very popular abroad. 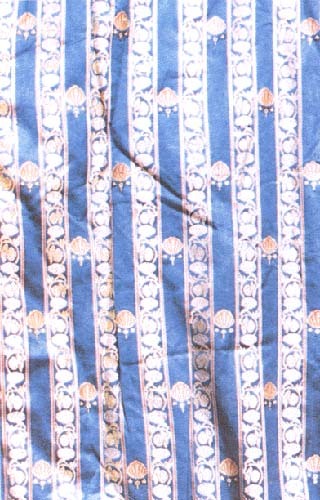 It was a silk fabric with a double ground very often with an admixture of wire thread. 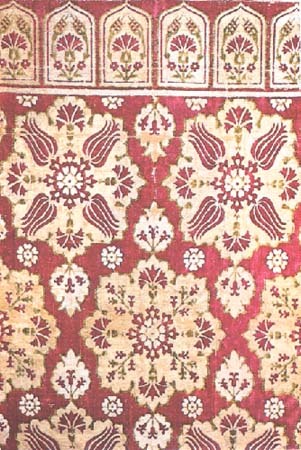 In the 16th century, orders were placed for this type of fabric for use in papal robes and the ceremonial apparel worn by the imperial entourage. Papal costumes made from Ottoman brocades are found in museums and church treasuries. 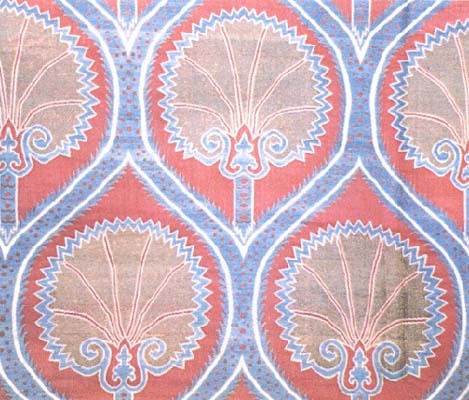 There were large numbers of kemha and catma weaving workshops in both Istanbul and Bursa, and a plan of a workshop specializing in the production of these particular fabrics is found in the palace archives. 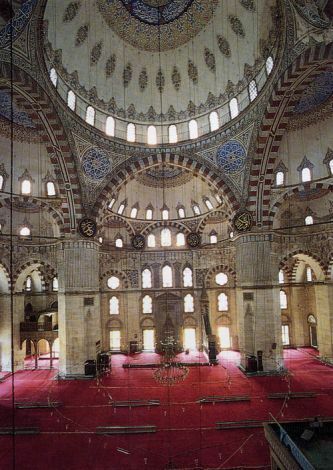 From the 17th century onwards, Ottoman art began to reveal a growing Western influence. This period is characterized by compositions consisting of large and small fan-shaped carnations and sprays of flowers covering the whole of the surface. Reference: Newspot/BYEGM;M.E. Ozer, "Eski Turk Kumas Adlari", Istanbul Edebiyat Fakultesi Tarih Dergisi, Istanbul 1952, p. 291-340.